Choosing a Homestay option will make learning English in London even easier because your hosts will be English speakers, and there’s no better way to practise what you learn in your English lessons than by chatting to people who live here. Working with British Council registered partners we have placed thousands of students with hosts all over the city. Hosts are recruited, trained and supported by our highly-trusted partners to ensure excellent service levels are delivered to each and every student. Our network of hosts are located in London zones 2 to 5, and where you are located is entirely your choice! We will be there each step of the way to offer guidance in making the right decision. Students are able to choose the right combination of services to best fit their needs — offering self-catering through to half-board meal plans and either single or twin rooms. · SC: Self-Catering: Buy and cook your own food. Use shared kitchen. *Please note, if you would like to cook your own food, then you must book self-catering options. Your room will come with a bed, wardrobe, linen, lamp, mirror and a bin. Your hosts will make sure you are comfortable and have everything you need. Prices per week, per person. Minimum stay 2 weeks. Our most popular student accommodation, share a large house with students like you in a central location. Living with a host family is a great way to practise your English. 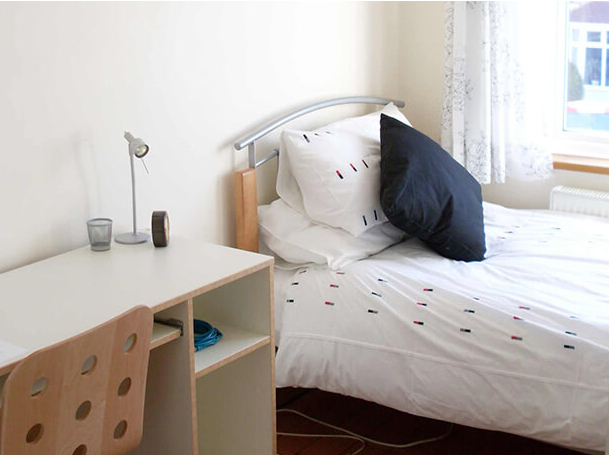 A great standard of rooms in student houseshares from short to long stays. Choose from 120 cutting-edge, newly built en-suite studio flats (London only).